Colby Bishop celebrates his match winner with his team-mates. Picture by Sally Ellis. Sam Wilding flicks a header at goal. Picture by Sally Ellis. Junior English on the ball for Leamington. Picture by Sally Ellis. LEAMINGTON go into tonight’s (Wednesday) Birmingham Senior Cup semi-final with Aston Villa full of confidence after a 1-0 win over Southport at the weekend in National League North. The clash offers the Brakes the opportunity to make it to a second final in three years, having beaten Wolverhampton Wanderers in the 2016/17 final to win the title for a sixth time. Villa however, return to the competition having won the oldest county cup competition 19 times in their history, and are expected to name a youthful side against Leamington. Brakes route to the semi-final started with a shootout win over Sutton Coldfield, before firing five past Lye Town and crushing West Bromwich Albion 4-1 in the quarter-final. New signing Dylan Parker could make his debut, having not featured in the Southport win, whilst fellow new arrival Elliot Hodge is expected to continue his recent run in the team – having started the past two matches down the left-side. The winners of Wednesday night’s game will face Nuneaton Borough in the final, who beat holders Stourbridge 2-1 – details of the final will be released following the second semi-final. Saturday’s win over Southport took the Brakes to the 40 point mark with only their second win of 2019, having last won against Altrincham back in January. 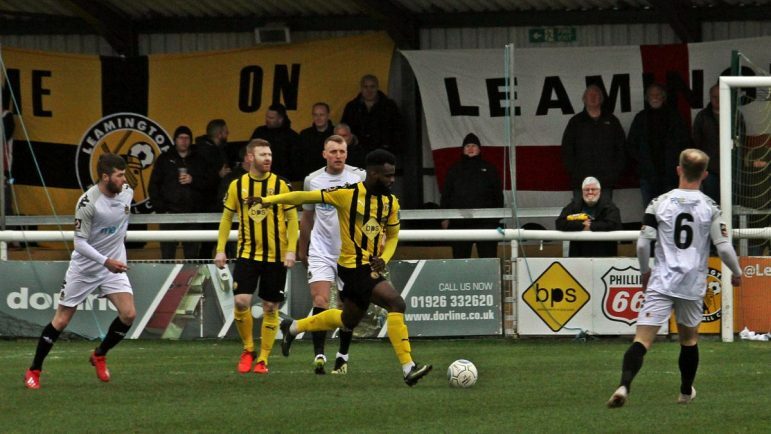 It puts Leamington 16th in the league, and ten points from the drop-zone, in a victory that manager Paul Holleran will be savouring for some time. Even with the hosts going down to ten-men for a second successive match, they were able to hold out for all three points. Colby Bishop’s early goal after seven minutes of play proved the decider, when he got in between keeper Dan Hanford and Andy Parry, who both hesitated, to burst into a pocket of space and tap into the empty net for his 21st of the season. He almost had a second when coming within inches of meeting a whipped cross from Jamie Hood, whilst the visitors had a chance of their own when Jack Sampson’s lob towards goal was tipped over by Tony Breeden. Reece Flanagan went close with a free-kick just before half-time, whilst Elliot Hodge provided a stunning centre for Ahmed Obeng after the interval which almost resulted in a second goal. Obeng was just unable to meet the cross from the left, after sticking out his right boot but being unable to make connection with the ball at the far post. Dion Charles meanwhile had an opportunity down the other end, beating James Mace but failing to test Breeden with the final effort. 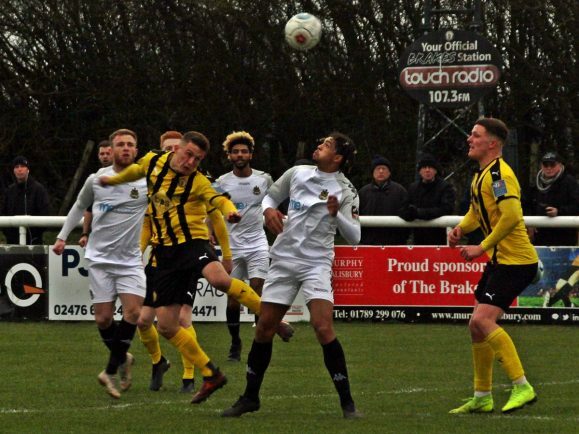 Ryan Astles wasted two efforts from a corner, before Junior English picked up the first booking of his eventual dismissal for putting a stop to a Southport attack. Callum Gittings made a return to the side in the final ten minutes, a welcome sight for the Brakes faithful, whilst Obeng had another opportunity to seal the win, but was unable to get to the ball ahead of the goalkeeper. English’s second booking of the afternoon was awarded after clashing with Green during a Southport attack, which left Leamington a man short in the final minutes. It would not matter too much however, as the Brakes held on for the victory. 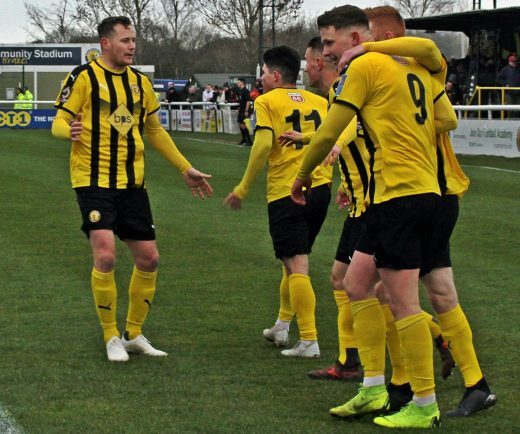 Going into their end of season run-in, Leamington face five teams in the bottom-half of the league out of their seven remaining fixtures, with momentum now in their favour after the much-needed victory at the weekend. They do however, face a tough challenge this weekend when visiting Chorley on Saturday (3pm), a side that currently sit top of the pile. Brakes will take confidence from the previous fixture though, having held their opponents to a 1-1 draw at the Phillips 66 Community Stadium back in December.